1. In a medium saucepan, heat 1 cup water, the butter, sugar, vanilla, salt, and cinnamon over medium-high heat until bubbling at the edges. Add flour and whisk until no lumps of flour remain. 2. Remove from heat. Add the eggs one at a time, whisking well after each addition. The dough will be very glossy and thick. Let stand 5 minutes. 3. Meanwhile, preheat a Belgian waffle iron and spray with cooking spray. Spoon 1/4 cup dough into center of each of the 4 waffle sections. Close lid and cook until golden brown, 5 to 10 minutes. Repeat with remaining dough. 4. Meanwhile, microwave cream 2 minutes. Quickly stir in chocolate and set aside. Mix sugar and cinnamon on a small plate. 5. Coat cooked waffles in cinnamon sugar mixture. 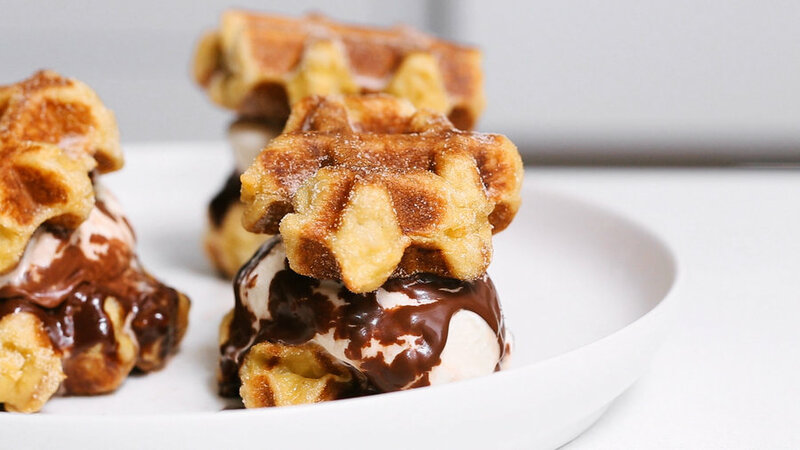 Top 4 waffles with ice cream and chocolate sauce, then top each with a second waffle. Sprinkle more cinnamon-sugar on top.